Join Theatre For a New Audience Board member Susan Stockel for a trip to London and Stratford-upon-Avon with Theatre for a New Audience Founding Artistic Director Jeffrey Horowitz. Click HERE for the full trip brochure and itinerary with sign-up information. Share your passion for Shakespeare and classic theatre with a select group of discerning travelers for a unique and enlightening British theatre experience, including special behind-the-scenes artistic discussions that only Theatre for a New Audience can provide. Enjoy superb performances, shared meals and conversation, private tours, exclusive meet and greet opportunities, and luxury accommodations. Founded in 1979, Theatre for a New Audience is a modern classical theatre dedicated to the language and ideas of Shakespeare and other great authors. 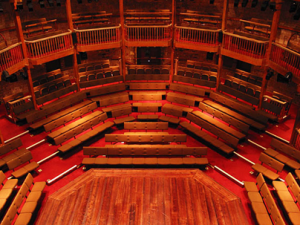 Over the past 20 years, Theatre for a New Audience has nurtured a special relationship with the Royal Shakespeare Company, as well as Shakespeare’s Globe Theatre and the National Theatre that has led to celebrated productions with artists such as Sir Peter Hall, Peter Brook, Mark Rylance, Michael Boyd and Trevor Nunn. Pictured above: Polonsky Shakespeare Center, photo ©David Sundberg/Esto. Below: The Swann Theatre, Stratford-Upon-Avon.